Maribel Garcia is a life-long resident of Laredo, Texas. She is a Martin H.S. high school graduate and a graduate of Texas State University. She was a teacher for 10 years with United I.S.D. During her time as a teacher she was Director of the United Middle Maverettes, Cheerleaders and is the founder of the United South Silver Steppers. 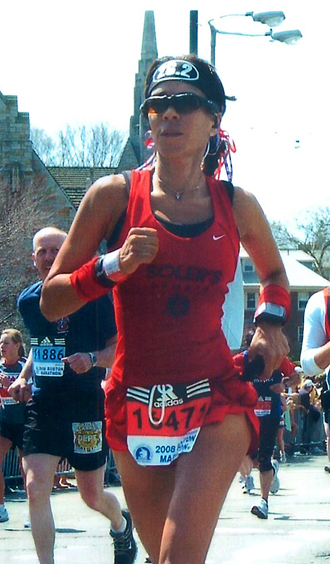 Maribel has always been a physical fitness enthusiast and has been dedicated to running for over 30 years. Throughout the years, Maribel’s dedication to running has surpassed personal goals and reached out to touch the lives of many community members who wanted to start running. She ran her first marathon at the age of 38 and since then has run over 60 marathons nationwide including qualifying for the prestigious Boston Marathon in 1999. She has run over 10 Boston Marathons and is currently training to run the Grandma Marathon in June. At the age of 58, Maribel is still running strong and dedicates her time to her passion of helping others achieve their fitness and running goals. Maribel believes in maintaining a well-balanced life through maximizing health, weight and overall wellbeing. She strives to live each day making conscious choices. Fitness is a key component of her life and her early morning runs are the most important part of the day. However, she is passionate and committed to helping others find that same balance. Her short-term goal will be to qualify for the Boston Marathon and run it again on her 60th birthday, thereby demonstrating that age is just a number and not a barrier to physical accomplishments. Maribel most recently became a certified 261 Fearless Coach and looks forward to launching a non-competitive running group whose mission is to empower women through women.